You and your family will feel right at home in this very well designed two-story, 4 bedroom, 5 bath home for sale on Cat Island in the desired Lady’s Island region in Beaufort SC. This prestigious home, in Hunter’s Ridge, sits on just over a half-acre with peaceful marsh and tidal creek views. Mature trees line Ridge Road, one of the nicest neighborhoods in the area. 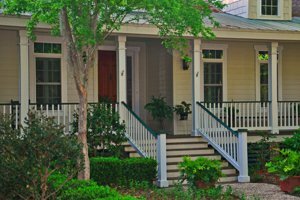 A large, traditional porch area welcomes you to the front door, where inside, you are greeted with an open entrance way and rich solid wood floors. Over 4,300 square feet of living space and nine-foot, crown-molded ceilings give this home a spacious feel throughout.To your left is a formal dining area and just ahead is the formal dining room with a stately brick fireplace. Large windows and patio doors provides a generous marsh view. A sizeable family room on the main floor also has a fireplace and opens to a well-appointed kitchen with marble countertops, a center island, and a convenient desk off to one side. The immaculate, well-designed kitchen has plenty of cupboard and drawer space. This open area features the perfect place to enjoy breakfast as the morning sun welcomes the day through a bay window. Off the kitchen lies a separate laundry room that leads to the attached 2 car garage. 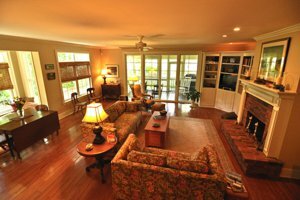 This main floor is also home to the master suite, with additional water views and access to the large screened in porch that runs the entire length of the rear of the home. It is the perfect relaxing retreat to end the day. The suite includes a generous bath area with separate shower and garden tub. 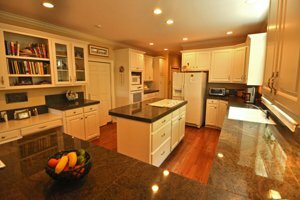 It features extensive counter space with dual sinks, a make-up area, and expansive mirrors. The main floor also includes a second bedroom with a full bath, and an office/study area. Two additional bedrooms are upstairs, each having their own full bathrooms. These bedrooms are separated by a central seating area on the second floor. A walk-in attic adds to the abundance of storage space in this home including its large closets throughout. You and your family will love the shaded backyard with plenty of space for entertaining, cook-outs, or to just sit back and enjoy. There is potential for a private dock to take even better advantage of its waterfront location. The enclosed rear porch offers protection from inclement weather and beautiful views of the tidal creek. This well-maintained home is convenient to shopping and dining options and is close to the Beaufort Hospital Medical District. Golf, swimming and tennis are nearby at The Sanctuary Golf Club, which also is home to the Cat Island Grill and Pub. 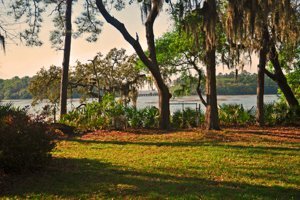 Lady’s Island has an acclaimed school district and Beaufort Academy on the island is a noted private school. This is a rare Lowcountry home that offers access to the amenities of Beaufort, SC with the seclusion and slower pace of waterfront living on Cat Island. A video of the property will be available soon.